A kitchen and bath redesign amps up style, storage and comfort for a St. Charles couple who downsized to a more practical condominium. Every winter, homeowners Gary and Joyce Shaw leave the harsh Midwest temperatures behind by escaping to the warmer climes of temperate Tucson, AZ. Thus, a downsizing of their St. Louis living arrangement seemed logical. The couple sought a smaller space that would maintain the quality of life they were used to and accommodate the furnishings from their previous, larger home. They wanted to be close to their places of work, shopping and downtown St. Charles, while also having easy access to downtown St. Louis. Their new home—a free-standing condominium in St. Charles—matches their design and living style perfectly and is maintenance free, making travel for extended periods of time worry free. A few updates and simple, yet clever, design interventions were necessary before move-in. French doors replaced the door between the porch and living room to allow easier blending of the two spaces; large tile was added to the sun porch; a walk-in closet was placed in the master bedroom for additional space and organization, and fresh paint and new carpet were installed throughout the house. Doorways and openings were also widened with the plan to age in place in mind. The original kitchen and master bath, however, were simply too dated. A complete renovation was necessary. Enter Ellen Kurtz of Ellen Kurtz Interiors. Kurtz worked closely with the couple in the redesign, ensuring they were part of the process of transforming the house into their new home. From the start, the design objective was to focus on quality, texture and storage space. The kitchen’s central feature is the smart, stacked-slate peninsula island topped with sleek granite countertops and paired with new stainless-steel appliances. The result is contemporary, tasteful and welcoming. 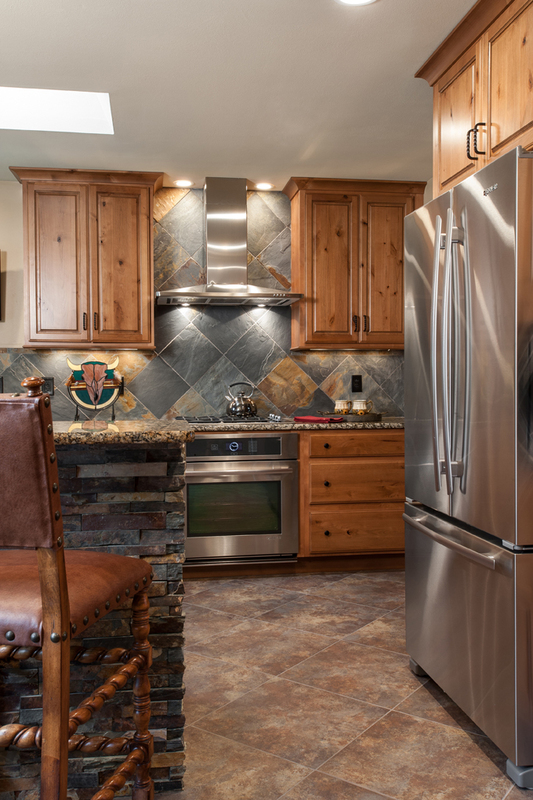 Knotty Alder wooden cabinets set a warm tone, and a counter-to-ceiling slate backsplash provides texture and high-end quality. 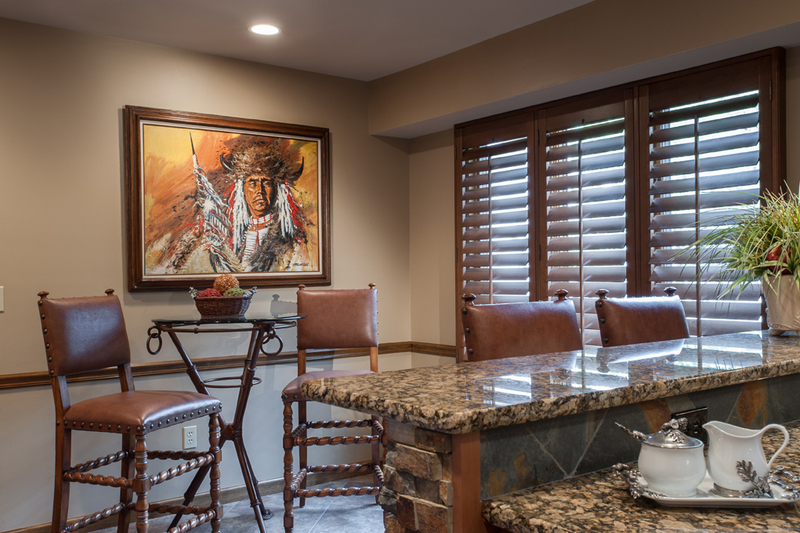 Plantation shutters in the dining and kitchen areas match the stain on the existing trim. 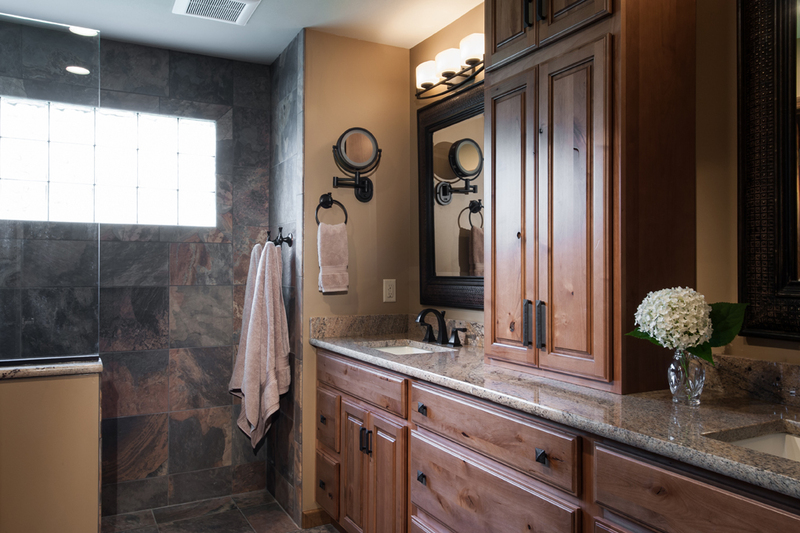 The Master Bath: The master bath was completely redesigned as a custom, mini haven of relaxation. The space continues the theme from the kitchen with slate tile cladding the entire room and a central, double vanity of Knotty Alder cabinetry. The toilet was enclosed for privacy, and the closet was expanded to provide additional storage. 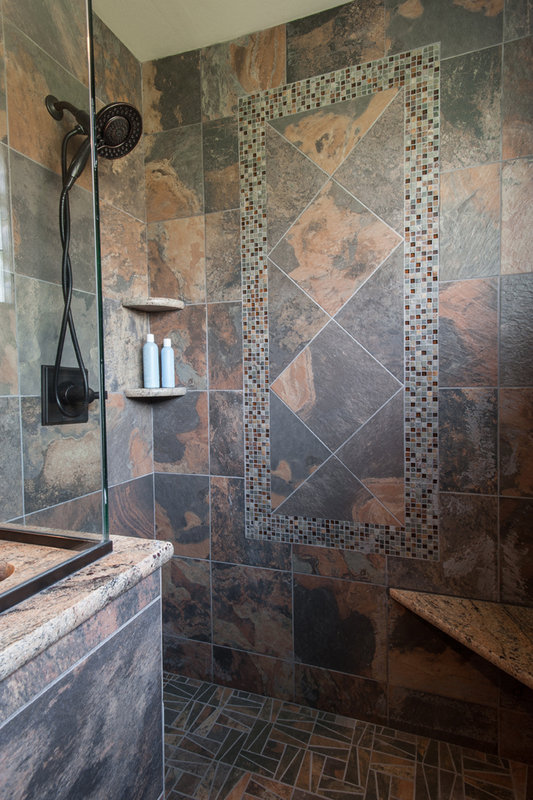 The homeowners’ favorite aspect of the home renovation is the gorgeous walk-in shower. Again thinking forward for aging in place, Kurtz lowered the shower floor creating a curbless entry. The shower walls are covered in slate with a large, central glass-tile accent. "The tile accents are on the floor,” Kurtz says. “It is a beautiful mosaic pattern in a slate-look porcelain. I added a frame of mosaic with glass and slate accents around the 12”x12” slate turned on diagonal. This is the feature you see as you walk into the shower." Kitchen and Bath Design Trends: Kitchen islands, or peninsula bars, are extremely popular as homes gradually have become larger and gatherings less formal. Homeowners increasingly are entertaining in the kitchen, and layouts are now incorporating suitable gathering space. Another new trend is the need for phone charging stations and laptop docking areas, along with the ever-present quest for a place for purses, keys and mail. 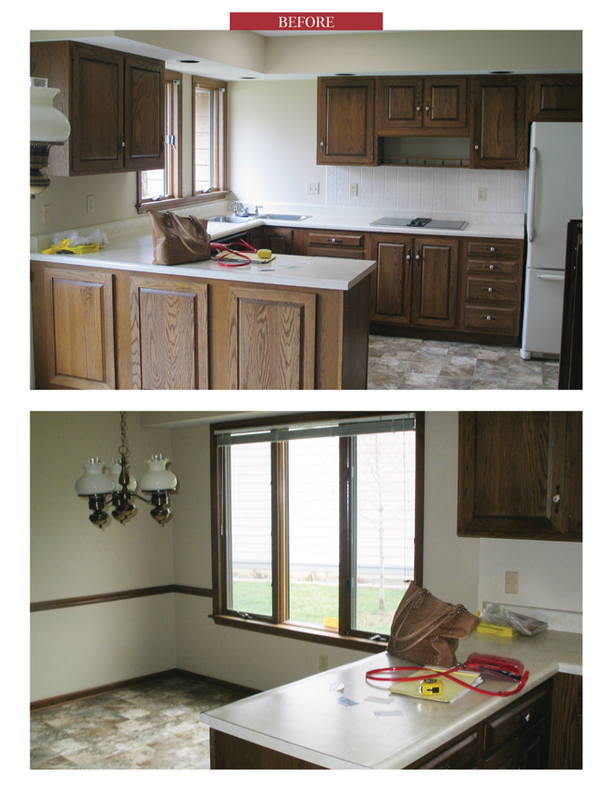 Pantries and cabinets are being modified to keep these items out of view and avoid clutter. Free-standing showers replace the bathtubs as a way to free up space for larger or double vanities and more storage. Gary and Joyce Shaw’s new St. Charles home incorporates all of these design principles and is the perfect “landing spot” for this couple. “We are so happy here, and, with Ellen's talent, we have been able to make this lovely home our own,” Joyce says.